—one that continues to hold true to this day. This is the story of Moore’s Law. 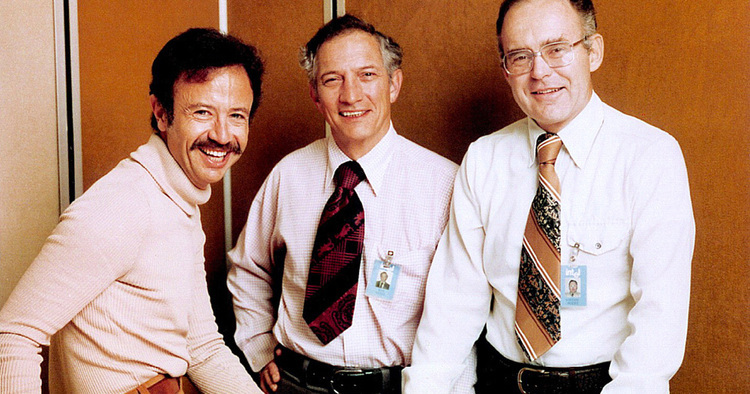 Who do you think have been the most influential figures in the computer industry? Most of you will be thinking of Bill Gates, or maybe Steve Jobs. A few of you might think about Alan Turing. But there’s one person who should be top of everybody’s list: Gordon Moore. A new book, Moore’s Law, by Arnold Thackray, David Brock, and Rachel Jones, tells the story of how the young chemist Gordon Moore changed the game of electronics forever. He led the way in the development of the technology that brought us computers and digital watches—and ultimately led to the Internet, smartphones, and Facebook. At the end of the 1950s, it was still common wisdom that the advanced technology necessary to put several circuit components on one small chip was just too costly. Most people said that it would always be cheaper to wire individual components together. Gordon Moore knew this was wrong. Moore started Micrologic, a division of Fairchild, dedicated to so called integrated circuits, which would lead to a new generation of smaller and more complex microchips. Micrologic’s chips would go on to be used by NASA in the Apollo program. After running Micrologic for a while, Moore had a unique inside understanding of the rapidly growing world of transistor-driven electronics, and could see where it was heading. In February 1965, he published an article in the journal Electronics called “The Future of Integrated Electronics,” in which he offered some startling predictions. Moore assembled statistics from the past decade of microchip production and, observing the exponential trend, predicted that the complexity of microchips would continue to double every year (he later revised this to every two years), while the manufacturing cost would continue to fall by approximately half every year. Now, 50 years later, this prediction has come to be called “Moore’s Law,” and—astonishingly, in this age of smartphones and wearables —continues to hold true. Learn the untold story of Gordon Moore in Moore’s Law, by Arnold Thackray, David Brock and Rachel Jones. You can also read the book’s key insights on Blinkist – it’ll only take 18 minutes! Conor is a freelance writer and translator living in Berlin. He likes traveling, bikes, rap music, and tacos. His work has been published on Matador Network, Serious Eats, Sprudge, and others. Find more of his work at conororourke.com.